Describe how to align your team to the V2MOM. Monitor and refresh your V2MOM. 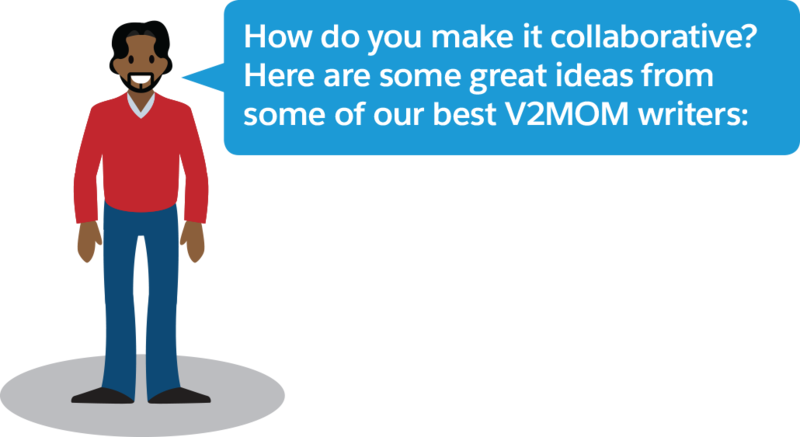 As a manager, think about what role your team members play in the creation of your V2MOM. Should they sit by and wait to see it unveiled? Are you the wizard behind the curtain delivering up courage or a brain? Not at all. And as an employee, you have a stake and voice in how your team winds its way down the yellow brick road in pursuit of your team Vision. Your V2MOM should be a collaborative, feedback-driven team effort. That’s how you get aligned on what you're trying to achieve, your team's priorities and accountabilities, and how success is measured. Draft it in a Quip doc and let team members provide comments and suggestions. When you have a good draft, set aside 2–4 hours in a team meeting to review and discuss your V2MOM. Challenge the team to create inspirational and aspirational Vision and Values to generate excitement and stimulate team creativity and innovation. This collaborative approach is key to making sure that everyone is clear and bought into the team priorities before your team members draft their own individual V2MOMs. It can be tempting for your employees to simply cut and paste your team V2MOM and call it a day. Don’t let it happen! Increase your employee’s engagement around the process by encouraging them to customize their own Vision and Values, and add the specific Methods they’ll use to achieve their Measures. And who’s going to know the specific Obstacles to overcome better than your employees who are executing their own work? Want even more engagement? Challenge them to include their personal development, wellness, and giving back (volunteering) Methods and Measures, too. The V2MOM is a living, breathing document. And it gets very grumpy if you don’t feed it and take care of it regularly. After you’ve written and published your V2MOM, there are lots of ways to use it throughout the year as a powerful and meaningful management tool. Encourage your employees to use the V2MOM in their one-on-ones to monitor, prioritize, and discuss progress on work. Use the V2MOM to guide decisions on how to prioritize time, resources, and budget. On a quarterly basis, encourage your employees to update their V2MOMs and then share and discuss progress in a quarterly staff meeting. Do all your current projects fit into your Methods? Are all your Measures still accurate and up-to-date? What’s your action plan for next quarter? What changes do we need to make to the V2MOM to reflect the current business realities? Of course, new items are going to come up throughout the year. Should you take on that new, exciting project sent your way? Maybe, maybe not. Your V2MOM can help guide you. Use it to spark dialogue among your team and inform your decision-making. Why all this emphasis on monitoring, updating, reprioritizing, and refreshing? Because given the pace of work and how fast things change, your V2MOMs must reflect the current realities of the work. Pick up your V2MOM and take a look. Are you using it every day? Is it inspirational and does it help you feel focused and clear on your direction? Download the V2MOM pack and complete the V2MOM Reflection. The V2MOM is a great way to get every employee in a company on the same page and working together to achieve business success. Remember a time in your career when you weren’t sure why you were doing something? Ever felt like a hamster running on a wheel without going anywhere? That’s exhausting. The V2MOM ensures that you know how your work supports the larger organization and why it’s important. What a great feeling to know that you have an impact and are making a difference! 100% of employees are required to create and publish their V2MOMs on time. 95% of Salesforce employees say they understand how their work contributes to the success of the company. We use V2MOMs to frame conversations at Town Halls and Quarterly Business Reviews. Nothing is more important than complete alignment in your organization. Imagine the power of 100% of your employees moving in the same direction, supporting each other, and being inspired by how they contribute to the organization. If you’re an employee writing your V2MOM for the first time, go bold and make it your guiding light. If you’re an experienced V2MOM author, think about what you’ve just read and consider making your V2MOM even stronger. 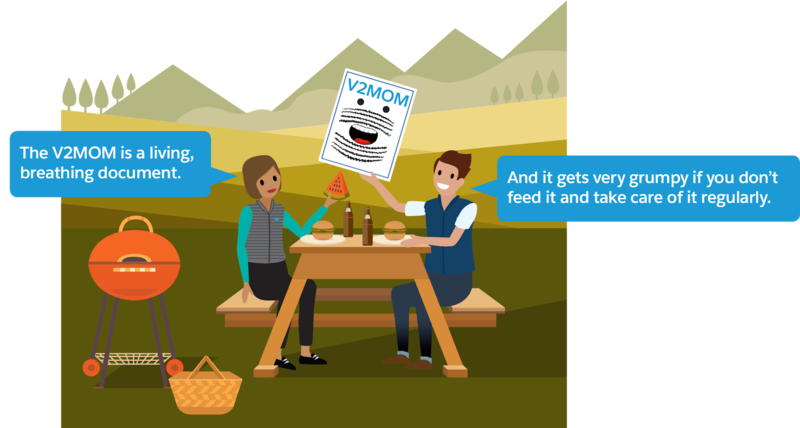 If you’re a manager, think about how you can use the V2MOM more effectively to manage and engage your team. And if your company isn’t using V2MOM today, think about how you can apply the V2MOM principles to your own goal-setting process. Who knows, maybe you can influence your company to start using V2MOM to drive organizational alignment!